Black Turmeric Plants is a kind of turmeric are currently rare to find, the efficacy of black turmeric has a very potent medicinal properties. Black Turmeric same shape as usual but the dried rhizome of turmeric its dark black when it is ripe. If his young unggu dark color. The veins on the back of his black, if the young roots brown color then clear. Although the way Breeding and planting the same as regular turmeric, but this Black Turmeric requires maintenance neat and very complicated. Her land must be mixed with sand and require moist soil and enough water but not too much water. 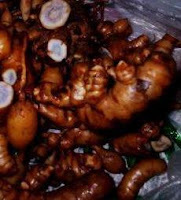 Black Turmeric is sprouting in a very long time and sometimes for 3 months new sprout.